Xtrem Snowboarding developer Yamago has announced the launch of its newest mobile title, Hilomi, on iOS and Android devices. 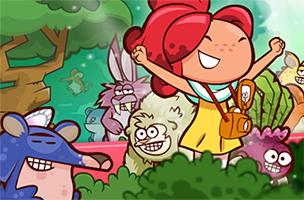 The side-scrolling platformer stars Hilomi, a little girl with big dreams, who wishes to travel the world taking pictures of every animal she can find. In each level, players will need to solve puzzles to find animals, with the game offering five different worlds for exploration. In each level of Hilomi, our heroine runs automatically from left to right on the screen, while players must manipulate the environment to keep her safe. Players can avoid pits and other altitude changes by dragging their finger on the earth to raise it up or stretch it horizontally to create bridges. As Hilomi runs, she’ll encounter one or more of the game’s 24 unique animal types, and must photograph it (them) to successfully complete the stage. This determines the path players must take to complete each level, depending on the location(s) of animals in the stage. In addition, players are limited in the number of interactions they can complete in a single level, so they must determine this correct path without running out of moves. Hilomi offers 100 levels, and eventually introduces players to more interactive items, like fire, sand, water and ice, as well as obstacles such as immovable rocks. Players can replay stages when they’ve made a mistake, and can share their progress with friends via Facebook and Twitter support. Hilomi is now available to download for free on iOS and Google Play. Check back soon to follow the game on AppData, our tracking platform for mobile and social apps and developers.